Fox Partners with Shazam for 'Glee: The Concert Movie' Now Available on Blu-ray! Experience your favorite stars, more performances, and GLEEful moments using Shazam! Twentieth Century Fox Home Entertainment has teamed with Shazam® to present an industry first – the premiere of the first Shazam-enabled Blu-ray and DVD with the release of 'Glee: The Concert Movie' on December 20th. 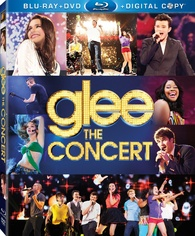 'Glee: The Concert Movie' stars Lea Michele, Jane Lynch, Cory Monteith, Chris Colfer, Dianna Agron, Darren Criss, Mark Salling, Naya Rivera, Heather Morris and the rest of the GLEE cast and is packed with new exciting never-before-seen and extended performances, clips of fans’ favorite characters, exclusive extras and more. Every time people use Shazam while watching the movie, their tag will live on in their Tag List, giving them access to the extras that they can “snack on” anytime and anywhere, so they can be engaged with the movie even when they’re not near a TV! Additionally, with the Shazam Friends feature, they can share their finds with their Facebook friends. You can find the latest specs for 'Glee: The Concert Movie' linked from our Blu-ray Release Schedule, where it's indexed under December 20.